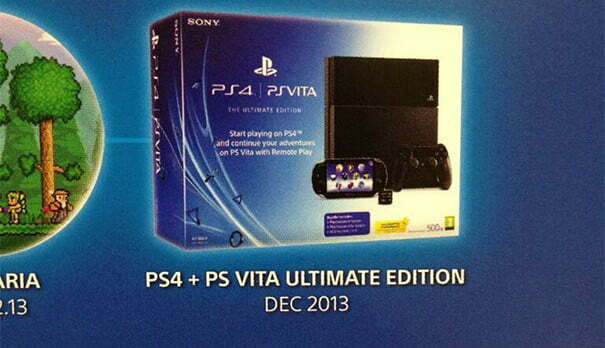 PlayStation 4 & PlayStation Vita Ultimate Edition Coming to UK in December? Sony could be preparing to introduce a bundle of their flagship console and handheld in the United Kingdom as the Holiday shopping season gets into high gear. As initially reported by MCV, Sony is set to sell the PlayStation 4 and PlayStation Vita in an “Ultimate Bundle” in the UK. While Sony has yet to officially confirm the bundle’s existence (or if it will be available in North America), an image from MCV’s magazine shows the the package for the currently rumored bundle advertises the utilization of the Remote Play feature. The bundle is rumored to be $500 (or £325) upon launch. Is the inclusion of the Vita going to help make up your mind about buying a PS4 now that both Next-gen consoles are available? Or is the inclusion of the Vita a dealbreaker? Sound off in the comments! Might just be a currency problem, but £325 seems pretty cheap, considering the PS4 is £349 right now haha. Would seem so, given the price you’ve provided. More around £400 would be more realistic.